The tour driver motioned for me to sit in the passenger seat of the 4×4. I was ready to go when he insisted that I buckle my seatbelt. I usually put it on automatically, but after a week and a half in India, I’d gotten used to the fact that every car I sat in did not have a functioning seatbelt. I pulled the belt across and searched for a place to buckle it. I looked to the driver for help. He was amused. He did a little Indian head waggle and held out his hand to tell me to stop — there was nothing to buckle the seatbelt into. In his limited English, he went on to explain that the belt was not for safety, it was for appearances. 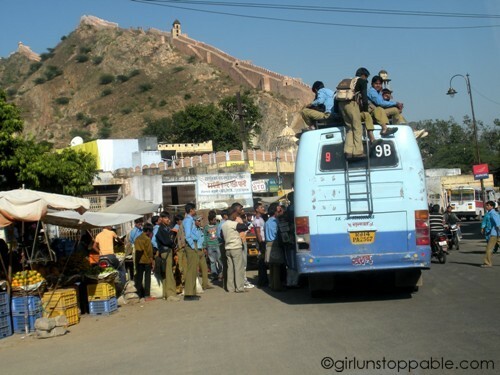 Apparently, there can a be steep fine for not buckling up in Jaipur. Since I was sitting in the front, it had to at least look like I was buckled in. Exploring the Central Museum. 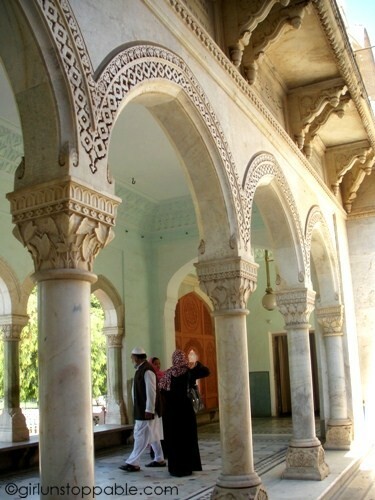 The building was as engaging as the artifacts inside. There’s an elephant walking down the street. No big deal. This van transporting teenage school boys clearly wasn’t going to leave until it was completely full — inside and out. 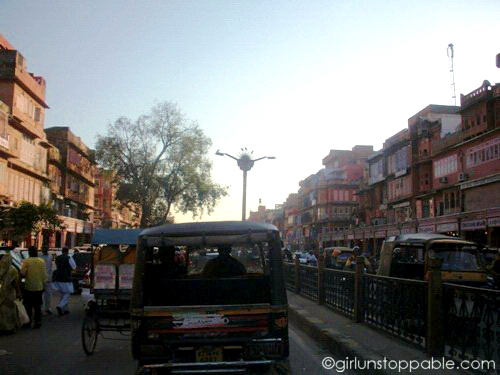 Cruising through the old part of Jaipur that’s given it the moniker, The Pink City. After visiting it, I feel more inclined to call it the Dusty Rose City. A road leading to the Central Museum. I loved this moment: the three kids smiling for the camera, the adults gathering around to watch, and the woman adjusting her amazing sari. This family hovered around me for a bit before asking me to take many, many pictures with them. 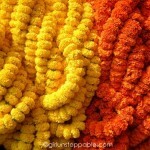 Before leaving the temple, I went to see what was on the other, quieter side. 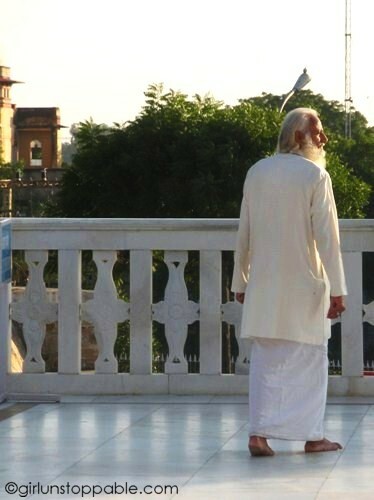 I came across this man who walked in a way that exuded peace and contentment. This woman was dressed in traditional Kalbelia attire (I found that out through a quick Internet search so correct me if I’m wrong) and was posing for a photo shoot. The woman in the center in red and gold was just married, and on the other side of her is her husband. 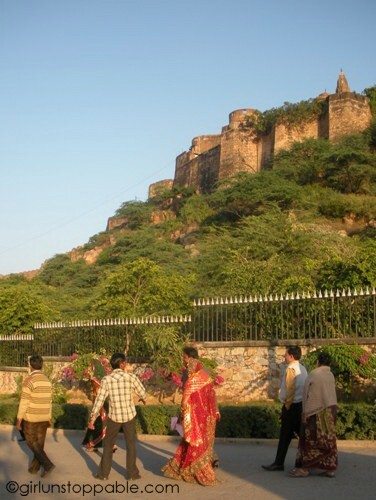 The newlyweds and their crew walked very slowly around the temple grounds. 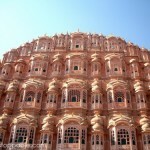 I recently visited Jaipur (my own photos here) and I found it a very refreshing change from the rest of India. 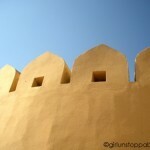 Even though it was a bit on the dirty side, there were lots of old fascinating stuff to see like palaces and forts. 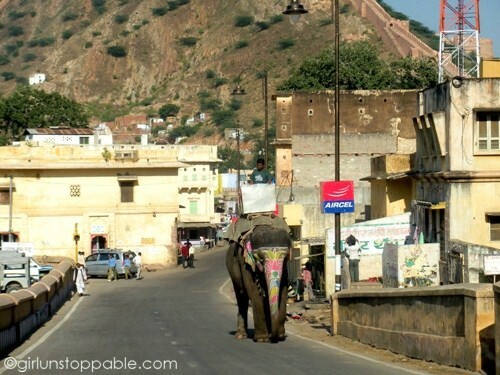 And yeah, sharing roads with elephants, no big deal! 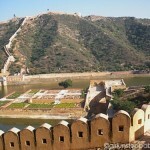 I started in Kolkata which was much dirtier, but I agree that Jaipur was pretty dirty as well. Trash aside, the sites were pretty awesome! you captured such great details in these photos. I especially like the elephant sauntering down the street and the people hopping a ride on top of the bus! Looks like a fabulous experience. I’m still debating whether I can pull out a quick trip there before I leave Asia this summer. Thanks, Mary. 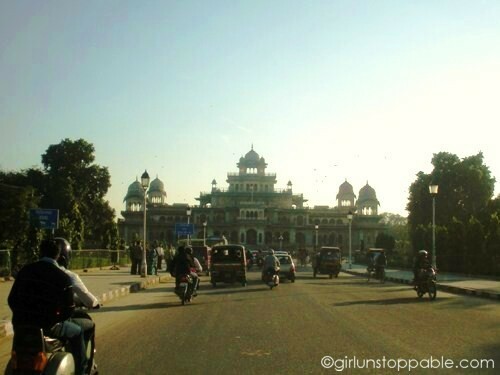 If you do go to India and you’re short on time, I think the Delhi-Agra-Jaipur triangle is a good option… those cities are not as overwhelming as other places and distances between them are relatively short (assuming you are not delayed or stuck in traffic). Your photos are beautiful. 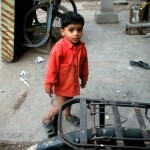 India is a place I have been hoping to see for a very long time! Beautiful essay! And so vibrant. 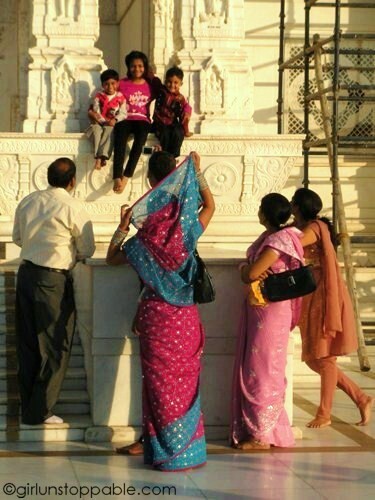 I really like the candid family shot as well as the woman in the traditional Kalbelia. India is definitely one of those places calling out to me.